Restoring lost luster to your boat's gel coat is as easy as 1-2-3 with Hula Boat Care Products. Learn how by using a simple step-by-step process. 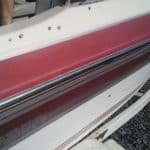 Boat Gel Coat Restoration and Polishing starting with Riptide Liquid Compound and a high speed or dual action polisher to remove heavy oxidation. using the Cyclo Polisher's and Hula Boat Care "Hang Ten Wax" to restore the gel goat on this Bayliner boat. Join the Hula Boat Care team as a product ambassador and earn product discounts and other valuable incentives! Joe I. San Jose, CA. Boat Beautiful Mobile Detail techs holding a “polish off” using Hula Boat Care products at the 2017 Austin Boat Show. Are You Having Issues with Spiders?